Classic Shortbread Cookies made with only takes 3 ingredients, mouthwatering, buttery and melt in your mouth delicious. A classic holiday cookie, made two ways! I love this time of year. I get to bake lots of cookies and share it with all my friends and family. Baking around the holidays is so nostalgic for me. I love to bake in my kitchen as I listen to Christmas music. Sometimes the same song over and over, because I have a handful of Christmas songs that I absolutely love or simply watch Christmas movies. I got this recipe years ago from a friend of mine who got it from her mom, so I know this recipe works as it’s been made over and over again over the years. I, myself, make every single year around the holidays, multiple times and it’s one of my family’s favorite cookie recipes now. These shortbread cookies are simply the best around. Your house will smell incredible, I couldn’t wait till they came out of the oven, just desperately needed to put one in my mouth as soon as possible. These cookies are great with a glass of milk, and I personally love them with my coffee in the morning. That’s my kind of breakfast, a yummy cookie and a good cup of joe. But let’s face it, who can have just one cookie? You need to have at least a couple cookies, and I usually do. 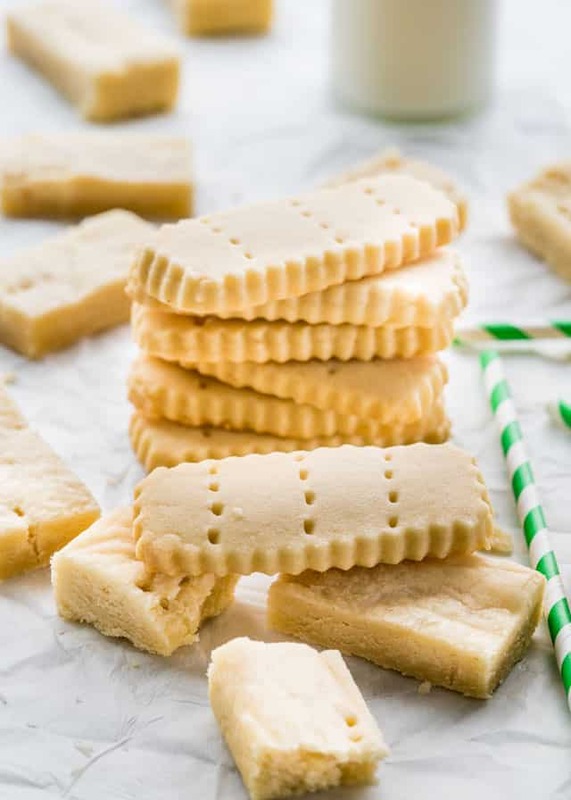 This simple recipe for classic shortbread cookies calls for only 3 ingredients my friends, only 3 ingredients and you get to have the most delectable, buttery and sweet shortbread cookie you’ll ever have in your life. We’re talking butter, sugar and flour, that’s all! And if you’re really brave, unlike me right now, dip them in some melted chocolate, that’s my husband’s way of eating them. Are you with me? Or, simply drizzle some caramel sauce, or chocolate sauce, or a light dusting of powdered sugar. And dip, dip in your coffee, or tea, or even hot cocoa. I think I need to go downstairs, I have an appointment with my cookies. Yes, absolutely! These cookies freeze incredibly well. 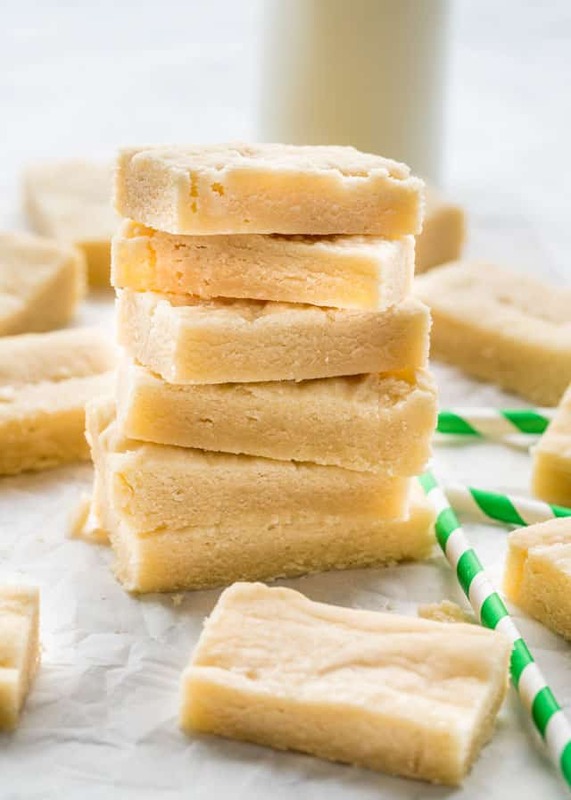 To freeze, place shortbread cookies in an airtight container and place in the freezer for up to 3 months. Add the butter to a large bowl and blend it until smooth using an electric mixer set at medium speed for about 30 seconds. Add the icing sugar and continue mixing until well incorporated. Scrape down the sides of the bowl and combine thoroughly. Add flour and mix at low speed until well blended. The mixture will be crumbled and soft. Pat dough into an ungreased cookie sheet, lined with parchment paper, with the parchment paper hanging off the sides to make it easy to lift out the cookies. Alternatively you can roll out the dough so that it's about 1/4 of an inch in thickness, you can knead it a bit just so that the dough comes together, but don't overwork it, then cut into your desired shape. Bake for 12 to 15 minutes, or until just done (slightly golden in color). Do not let them get brown. Remove from the oven. If using a cookie sheet, lift out the cookies from the sheet using the parchment paper and cut into desired shapes. Finish cooling the cookies on a rack. Because I'm using salted butter there's no need to add salt to the recipe, if you only have unsalted butter, add about 1/4 tsp salt to the recipe. I used this shortbread cookie cutter. For the video I divided the dough in half and used one half in an 8x8 inch baking pan lined with parchment paper, and rolled the rest to use with the cookie cutter. This recipe will yield about 36 cookies. 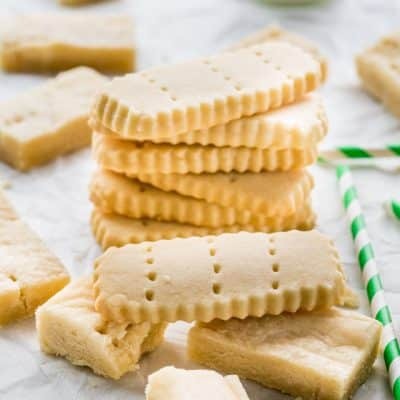 To freeze, place shortbread cookies in an airtight container and place in the freezer for up to 3 months. Followed your instructions to the “t” and the cookies came out delectably delicious! This shortbread recipie is the best! The dough was a bit tricky to roll out without working it a little but they turned out fantastick every time. I added a little bit of almond extract (about half a capful) n I touch more flour to compensate for the extra moisture. I highly recommend using the almond they were even tastier. This is a very good classic recipe for shortbread cookies. I cut the recipe in half and everything turned out well. The only thing I did differently was sift the flour and icing sugar. When it was time to add the flour I added it a half cup at a time only because this is a new recipe to me and I sometimes find with new recipes that the batter sometimes gets too dry and crumbly and then the dough is too hard to roll. In this case, everything was fine and the dough rolled well. The cookies are delicious and I will use this recipe again. If you use a cookie cutter, cut out the shapes before baking. If you try to cut them afterwards, they’ll all crack. The photo right before the recipe card shows the cookies we cut with a knife- they still have nice clean edges. Just started to make recipe and see that measurements are questionable. The butter measurement is correct but the flour and sugar are not right and I’m not sure which weights to go by. Hi Nick, I just went and double checked the recipe and everything is correct. What looks off to you? After I baked the cookies, they look ready and taste delicious but they’re breaking real easily and the middle doesn’t seem fully cooked. Not sure where I went wrong. They will continue to cook as they cool down. The top layer of the shortbread flaked off. Maybe I didn’t mix the ingredients well enough so the dough wasn’t smooth? Easy to follow recipe. Dough worked out easy to use and didn’t need a rolling pin. Just pat with hands and cut with Christmas cookie cutters. I used 1/2 cup cornstarch in place of 1/2 cup of the flour. I used a dough blender rather than mixers. Only thing I found was that they were too sweet for me. Next time I will try using half a cup of icing sugar. Hubby didn’t find them to sweet but then he usually likes things sweeter than I do. I’m looking to make these with my sone over the xmas period. If I wanted to add chocolate chips to the recipe, how much would you suggest and would it change any cooking times? I would suggest using 1 cup of mini chocolate chips. Enjoy! Thanks a million Jo! This is brilliant. It’s Christmas Eve and I just made these for my favourite cousin. The shortbread came out GORGEOUSLY. Both in colour and texture. I can’t wait to surprise my ‘cuz tomorrow .. well erm… later today since it’s just about midnight hahah, with these cookies! Baked goods make the best gifts! Hugs and happiness to you! So glad you liked these! Happy Holidays!! How long do I wait for the shortbread to cool before I can cut it? These are the best shortbread cookies I have ever made or eaten. Three ingredients, so simple and pure. ……….. Such a simple, great shortbread recipe! Perfect results! Thank you!!!! I was a little confused until I remembered some are packaged as “half stick” . Yes we’re referring to the regular sticks of butter that have 8tbsp!